Jonathan Voudrie has a Bachelors degree in counseling, is in PTSD recovery, an Oculus Rift owner, and is a Twitch streamer that sees the potential for VR technology to improve people’s lives. He talked with us about how VR has helped him get active, has helped his body become healthier, and how VR can help others do the same. He also shared with us some mixed reality capture tips and VR advancements that are going to change the industry as we know it. Keep reading to find out more about how VR has changed Jonathan’s life and how it can change yours! VRFI: Hi Jonathan, it’s great that you’re in recovery! Good for you! You mention that VR is therapeutic, can you tell us more about how it’s helped you and others too? JV: I think I first realized just how therapeutic VR is when I scored my first goal in Echo Arena. There’s something about VR that convinces your brain you are around other people and you just naturally engage and be social. For me, PTSD is very sensual. I’m very in tune with all of my senses and pick up everything going on around me. VR tones that down considerably and I only have to deal with a handful of senses instead of all of them. When I scored my first goal in Echo Arena it truly felt like I was part of a team and like I had just scored a goal that meant something, just like playing soccer growing up as a kid. As for how I have seen it help others, while I don’t actually know anyone else in my area who has VR, I’ve read article after article and story after story about how it has empowered and enabled those with disabilities such as being unable to walk, forms of Down Syndrome, and what not. We have only scratched the surface on what is possible with VR, and I’m so thankful to be a part of it in its infancy. VRFI: For our readers who are in recovery due to PTSD, anxiety, depression, and other mental or physical health issues, what would you recommend that they try? JV: So for me, I just use VR for the games. There are so many cool things you can experience in VR that is either impossible or impractical to experience in real life, such as flying a spaceship or riding a tank. With VR, stock shooters are basically like playing paintball or airsoft but from the luxury of your room. VR takes you to so many exotic and wondrous places and I think that is the beauty of VR and the sense of wonder and amazement and just getting back in touch with your inner child is therapeutic and will help you both be more comfortable with yourself and more comfortable around others. VRFI: How has VR increased awareness and impacted those that use it? JV: In VR you get a sense of realism unattainable in 2D format. You can actually experience being somewhere and doing something in VR. Having these experiences broadens your horizon and changes your perspective on what is possible, not only with the incredible technology VR relies upon but in how our brains work and react in VR. After you experience VR, and I mean really experience VR (not just some demo somewhere), you’ll just ‘get it’. You’ll understand. 2D can’t do that. VRFI: What drew you to the Oculus Rift over other headsets? JV: I originally thought VR was something I wouldn’t be able to get until years from now…it’s too expensive! At the time I sort of preferred Vive over Rift, but it was so much more expensive. Then the Summer of Rift sale started. At the time I was looking to change my lifestyle a bit, become more active, and what not and an Oculus Rift seemed like a perfect chance. Before I actually experienced VR for the first time, I would sometimes have dreams where I was playing VR games, particularly Space Pirate Trainer. At the end of the day, I chose Rift over other headsets because it was the one I could afford. VRFI: You went from 172 pounds to 154 — that’s 18 pounds! Congrats! Did VR alone help you achieve this weight loss or did you also couple it with a healthy eating plan? JV: To be a bit more specific, I just recently lost that weight. I was still 172 pounds back in February so I’ve lost roughly 7 pounds a month or so. Due to financial reasons, I had to change what I ate and that paired with continuing to stay active in VR resulted in the significant weight loss in such a short amount of time. For me, food has always been a struggle. For 3 days after my birth, I refused to eat and lost 1/3 of my weight. I’ve always had difficulty finding things I would eat or could eat and until 2014 or so I only weighed 110-120 pounds. One day I started feeling hungry again and gained 50 pounds in 6 months or so. I think my body thought it was still in ‘survival mode’ and would try to turn as much of the food I ate into fat as possible in anticipation I wouldn’t have anything to eat for a while. Now that I eat regularly, it doesn’t need that anymore so the change in food diet has helped a lot. I still get all the calories I need (probably), but I also lose the extra weight I don’t need. 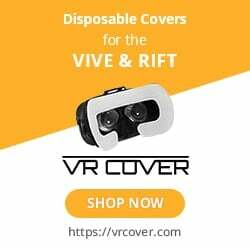 VRFI: You mentioned to us that you play VR games like Stand Out, DiRT Rally, Audioshield, From Other Suns, Sprint Vector, and Soundboxing to stay active. Which game would you say delivers the best sweat session? JV: Sprint Vector is probably the best sweat session I’ve experienced so far. In all fairness, I’ve not gone back to it for a decent session since I lost this weight so perhaps I’m more used to it now, but having played it for 6 hours straight at launch let me tell you I was WIPED OUT. Even 2 hours during the closed beta week had my arms super weak. VRFI: You stream online, what topics do you cover and what’s your channel name? JV: My Twitch is twitch.tv/bounty_v, and I primarily stream VR games. Currently, I have a weekly schedule which I’ve got up as a panel and I stream something different every day of the week. My focus when I stream is a positive attitude/atmosphere, chat interaction, and having fun. From time to time I talk about PTSD and my struggles with it or explain the reasons behind why I have some things up on my stream such as my heart rate. VRFI: You mentioned to us earlier that you use LIV for mixed reality capture. LIV’s platform is amazing and they’re super helpful with advice on how to capture. Do you have any tips for anyone who’s just getting started with LIV? JV: My first tip is, join their discord! It’s liv.chat they are very friendly and very helpful. My second tip would be as soon as you have installed LIV and launched it for the first time click “Open the Guide” it explains everything you need to know. As a Rift owner, I found I needed to actually wear my headset (or cover the sensor above the lenses to trick it into thinking I was wearing it) to use the configuration software such as VIVR or TribalInstincts. Right now, I highly recommend using VIVR. It’s free and also on Steam. You’ll have your externalcamera.cfg in MINUTES. I’m not kidding. Lastly, don’t use an R9 390! Just don’t! VRFI: Using a heart rate monitor like the Wahoo TICKR with Audioshield is great for tracking readings accurately, especially while in VR games without a built-in heart rate or calorie burn tracker. Have you found that you push yourself harder now that you have it? JV: That’s a good question. I think I do because I’ll play a song, check my heart rate, notice it was unimpressively low, and try to find a harder song or play on a harder difficulty. It’s not a work out if my heart rate is a stable 130BPM! VRFI: Using virtual reality as a form of exercise has helped so many people achieve their weight loss, health, and fitness goals. Why is VR so great for fitness? JV: The great thing about VR and fitness is you enjoy it and as you notice you are able to be more active and you WANT to be more active, so it creates a healthy snowball effect. VRFI: The snowball effect of being and staying active is so true! We absolutely love that concept. What we put our focus on grows! VRFI: Are there any exercise games for Oculus that aren’t released yet or that you’d like to play? JV: There are! The first rhythm game I ever saw was Holodance back when it was FIRST ANNOUNCED. I do not yet own it, as I already have Audioshield and Soundboxing. Also, BOXVR looks really good for workouts too. As a Twitch streamer using a Rift, a game being able to properly run in OpenVR on Rift is very important to me. Without that as a feature I am unable to capture VR properly or see my Twitch chat in game, leaving me to rely on other methods of capture such as desktop window and using text to speech. Beat Saber, a small game you may have heard of, releases on May 1st and I’d absolutely love to play that one. I’m a big Star Wars fan and the idea of laser swords cutting metal cubes rolling down an assembly line is highly appealing. The main thing preventing me from getting these games is money, or I’d have ALL THE GAMES haha. VRFI: VR is a therapeutic medium that is helping people reconnect with their playfulness and reigniting their health and mental well-being. Which causes, apps, companies, or individuals do you think are fighting the good fight in the virtual reality industry? JV: LIV, Machinima’s VR Power Hour, ProtubeVR, and The Khronos Group Inc’s OpenXR. LIV is fighting the good fight by pushing for mixed reality to become an industry standard as a format for advertising VR and exposing the masses to VR in general. Mixed reality capture is truly the future and the future is here! In that same vein, Machinima’s VR Power Hour has their own mixed reality setup going and they are live with their show on a daily basis. Yes, that Machinima. They are giving VR a lot of exposure both by how they capture it and what they do on their show. The companies making VR stocks, ProtubeVR, in particular, come to mind. Why? A VR stock is very important if you play a shooter in VR such as Stand Out or Onward; both for the accuracy and for the immersion. ProtubeVR offers, in my opinion, the highest quality stock on the market. In the near future, Protube will be releasing a magnetic cup design allowing for more freedom of movement. Playing shooters with a VR stock is SO MUCH FUN OMG. It’s a whole different game. Another company is The Khronos Group Inc. They are currently working on an open platform initiative for VR which would provide a standard API for all headsets on the market going forward. Google: “OpenXR” to read more about it! Why is this important? Well suddenly it won’t matter what headset you wear – games will just work as is and everything will be universal. This opens up a lot of games to a lot of headsets! Lastly, Team Heartland Gaming. I joined Team Heartland Gaming as a VR streamer earlier this year, and it’s just filled with a bunch of like-minded people with all sorts of networking connections spreading a positive influence to viewers as well as exposure for VR and how gaming can help in general. There are others in THG who also regularly work out in VR and give VR Fitness good exposure. Team Heartland Gaming is a Midwest gaming organization that features competitive e-sports teams, streamers and casual players alike. We’ve experienced a lot of awesome growth and wins in our respective e-sports stuff, and I’m thankful to be a part of it all! VRFI: Thanks for chatting with us, Jonathan! You can find Jonathan on Twitch and other social channels. Shane Hoalst is VP of Digital Marketing at Black Box VR and Editor in Cheif of VR Fitness Insider. He has over 15 years of experience in marketing and e-commerce. He spent a big part of his career at Bodybuilding.com and has a passion for VR, fitness, and technology.